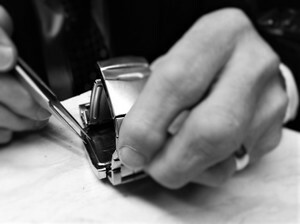 At Wilkins Jewellers we have decades of experience in repairing, engraving and servicing your most precious pieces. Our workshop caters for repairs including ring sizing*, watch battery testing and replacement, watch strap alterations, silver and gold soldering, and polishing to name but a few. If in doubt our experienced team members will be able to assist you in your enquiry. Whether it's an item purchased from us or a gift from home, we can personalise many objects in our workshop with engraving. Glass or metal, block or script, we can help you create something special. Please note: prices dependant on the object surface and engraving length. We also offer a hand engraved service, suitable for complex designs, with prices charged per character. Our workshop can supply and fit new batteries, fit watch straps and alter links while you wait! We also offer watch servicing and repairs, and can also provide an estimate service if required. For complex jobs, in most cases, we can also provide a free estimate service. Our workshop can size rings for you quickly and efficiently, and we endeavour to work with you if deadlines are specified. We can also fit ring clips, polish and check your jewellery items and provide you with a complete valuation service provided by The Guild of Valuers and Jewellers. DID YOU KNOW - We can engrave and personalise gifts and glassware in our workshop? Ask us for more details. Fitting parts e.g. new clasps, safety chains etc. * Ring sizing for silver and yellow gold only in our workshop. White gold, platinum and titanium will be outsourced.